The SmartNode Branch eXchange (SNBX) IP-PBX Appliance is a plug-and-play VoIP appliance loaded with Microsoft Windows 7 and 3CX Phone System, an award-winning software-based IP PBX for Microsoft Windows. Capable of supporting up to 64 calls, the SNBX VoIP appliance can support any 3CX edition supporting 4, 8, 16, 32 and 64 simultaneous calls with RTP Relay and Transcoding (The SNBX comes with 3CX Version 12 Free Edition supporting limited features and 2 simultaneous. More calls and features can be unlocked with 3CX license keys that must be purchased separately). In addition to running 3CX Phone System, the SNBX web GUI provides device monitoring and application management; plus, is open to 3rd party applications. The SNBX VoIP Appliance fits your network by supporting most IP phones and softphones. You can keep your trusted PSTN lines or analog/ISDN phone equipment by simply adding Patton’s SmartNode Gateways. Or you can provide secure, prioritized VoIP by using a SmartNode VoIP Router to connect to your SIP trunks. Setup is quick and easy as the SNBX IP-PBX appliance provides a built-in SmartNode configuration tool. Plug and Play—Comes with 3CX Phone System Version 12 (Free Edition: 2 simultaneous calls) and Windows 7 already installed (More calls can be unlocked with 3CX license keys). Up to 64 SIP Calls with Transcoding—Supports any 3CX edition up to 64 simultaneous calls and supports up to 500 extensions. Monitoring and Management—Web GUI for device monitoring and application management. Also includes built-in SmartNode Gateway configurator. BYOP (Bring your own phone)—Choose your own IP phones or softphones; no vendor lock-in. Keep Your Existing Equipment—Add a SmartNode Gateway to connect existing analog/ISDN equipment. 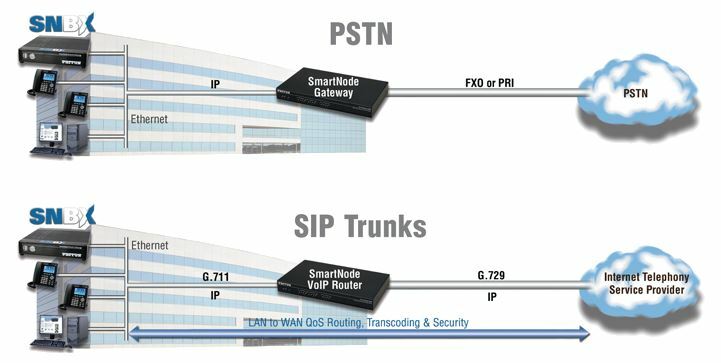 SIP Trunks or PSTN—Save on monthly call costs using SIP Trunks or receive and make calls via the standard PSTN using SmartNode Gateways and VoIP Routers. Break free from expensive proprietary phone systems and move up to an open standard IP-PBX appliance that increases employee productivity and costs much less. Evolve your communications by enabling employee mobility. Calls can be made and answered seamlessly from outside the office, and voice-mail and faxes received via email. Globalize your business by connecting branch offices and re-directing local customer service numbers via the internet to your phone system at negligible cost. 3CX Phone System is made to scale with your business and save you money on consultants’ fees. Supported plug-and-play IP phones are simple to add with the administrator interface, and supported Patton hardware has configuration templates built right in. Overcome the limitations of hardware-based PBX systems, reduce costs significantly and add advanced communication features that will make your company more efficient and competitive!